East End Press, 9780997530445, 352pp. 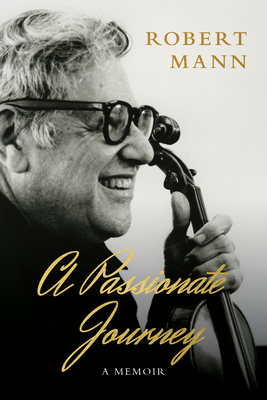 Growing up as an outdoorsy, nature-loving child in Portland, Oregon, Robert Mann wanted to be a forest ranger, but it was violin lessons—and his parents’ encouragement—that ultimately launched him on a remarkable journey that would span a lifetime and five continents as he pursued his passion for classical music as a violinist, composer, conductor, and teacher. In this fascinating and far-ranging memoir, he looks back at the struggles and triumphs of that journey, as well as the unique insights and experiences he’s gained along the way. From their beginnings in 1947, the Juilliard String Quartet set out to play new music as if it had been composed long ago, and to play a classical piece as if it had just been written. At first, the fledging combo struggled to compete with the more established European string quartets, while also coping with the inevitable difficulties of trying to blend four singular personalities and talents into a harmonious whole, but by the time Mann retired from the group some fifty-one years later, the Julliard String Quartet had played close to six thousand concerts on every continent except Africa and Antarctica and become an enduring, beloved institution in American music. They won three Grammys for their recordings, while sharing their distinctive sound with such notable figures as Glenn Gould, Aaron Copland, Leonard Bernstein, and even Albert Einstein. A Passionate Journey is a collection of both spoken and written words in the form of essays, letters, lectures, and transcribed interviews from various times in his life. Together they offer an engrossing glimpse into a life filled with musical milestones and into the fascinating mind of a musical giant. Robert Mann was born in Portland Oregon on July 19, 1920. He is a violinist, composer, conductor, and most notably the founding member of the Julliard String Quartet. He is also a faculty member at the Manhatten School of Music. Mann was the first violinist of the Julliard String Quarter for over fifty years until his retirement in 1997. Mr. Mann was the recipient of the coveted Naumburg Competition in 1941 and now serves on the Board of Directors and is the President Emeritus. In concert with the Julliard String Quartet he is the winner of 5 Grammy Awards including a Lifetime Achievement Award. He lives in New York City with his wife Lucy Rowan Mann.